Hillary Clinton on Thursday dismissed Bernie Sanders' latest attack that she isn't qualified to be president. "Well, it's kind of a silly thing to say," Clinton said with a laugh while speaking to reporters outside Yankee Stadium in the Bronx. "But I'm going to trust the voters of New York who know me and have voted for me three times -- twice for Senate and once in the presidential primary." "Look, I don't know why he's saying that," she added, "But I will take Bernie Sanders over Donald Trump or Ted Cruz any time, so let's keep our eye on what's really at stake in this election." Asked if New York could be in play for Sanders in the state's Apr. 19 primary, Clinton said, "Oh, that's up to the voters. The voters will decide that." Clinton, who won New York's Democratic primary in 2008 against then-Sen. Obama, blasted the current Republican field and said the candidates' values "are so antithetical to what's right for New York or what's right for America." She also appeared to dismiss the suggestion from Sanders' campaign manager, Jeff Weaver, that there might be a contested Democratic convention this July. "I don't really know what that means," Clinton said. According to CBS News' latest count, Clinton leads with 1,748 delegates and Sanders has picked up 1,052. 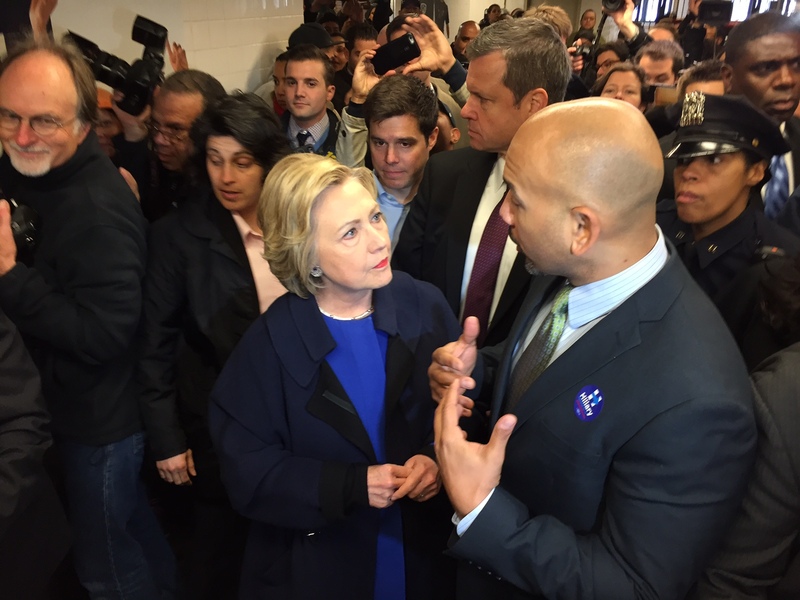 After her brief gaggle with reporters, she rode the New York city subway from 161st Street to 170th Street on the 4 train. It took her a few tries to get through the turnstyle. At a Sanders rally in Philadelphia Wednesday night, the Vermont independent questioned Clinton's ability to lead the country. "I don't believe that she is qualified," Sanders told a cheering crowd of more than 9,000 people. Clinton served as President Obama's secretary of state from 2009 to 2013 and served as a U.S. senator from New York from 2001 to 2009. He then listed the reasons why he thinks she's unqualified, and defended his comment as a response to what Clinton had said about him. But she never explicitly said Sanders was unqualified. In an interview on MSNBC's "Morning Joe," Clinton was asked whether Sanders is ready to be president. She declined to answer directly and said she would "leave it to voters to decide who of us can do the job the country needs." She also said his interview with the New York Daily News "raised a lot of questions" because she said it seemed like he didn't know how to break up the big banks. The White House weighed in on the tense exchange on Thursday. Aboard Air Force One en route to Chicago, spokesman Eric Schultz said the president believes Clinton is qualified to be president and that she "comes to the race with more experience than any non-vice president" in recent campaign history. Schultz said Mr. Obama was "fortunate" to have her serve in his administration and that he was "proud of that service."